Georgina O’Hara from St. Thomas Parish in Glen Mills venerates the relic of Padre Pio at the Cathedral Basilica of SS. Peter and Paul on Sunday, May 7. Philadelphia’s Cathedral Basilica of SS. 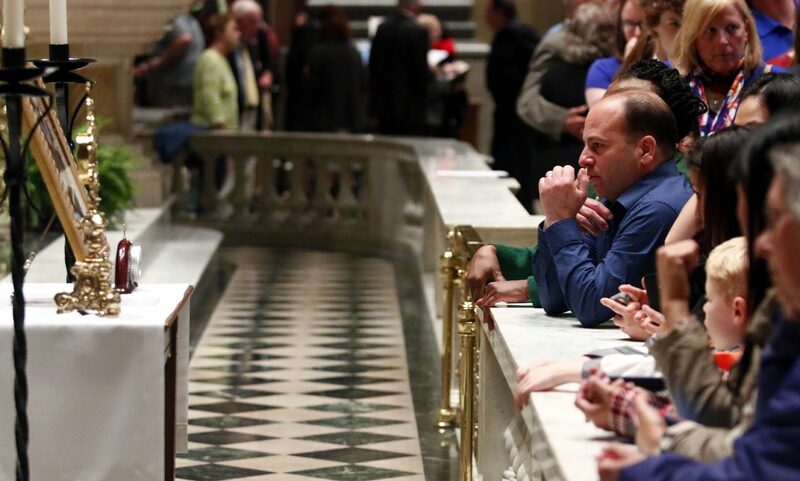 Peter and Paul was the first stop on an American tour of relics of St. Pio of Pietrelcina (Padre Pio) from Saturday, May 6 through Monday, May 8. The tour of the relics will continue with stops in five other U.S. cities this month, then resume in September with six more including in New York City. Padre Pio (1887-1968) was born Francesco Forgione in Pietrelcina, Italy. He was a priest, Capuchin friar, mystic and stigmatist (bearing wounds similar to those of the crucified Jesus) known especially for his power in the confessional. In death his reputation for sanctity only increased with a worldwide following. He was beatified in 1999 and canonized in 2002. 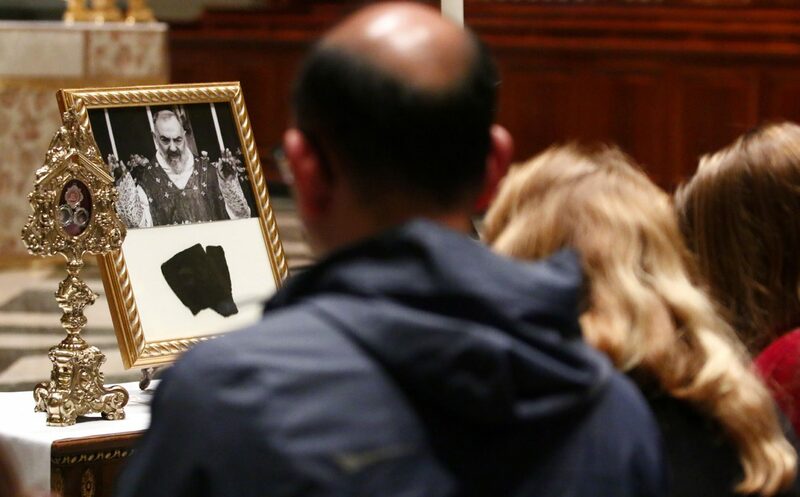 The popularity of St. Pio in Philadelphia was made clear by the number of people who stopped in at the cathedral to pray as the veneration began on Saturday evening, right after the Mass for married couples. The relics displayed during the tour included a lock of his hair, a glove used to conceal the wound on his hand and a piece of cloth from his bed. Many of the devotees of St. Pio who came to the cathedral at the opening of the veneration traveled far. For example Deacon Ed Malone and his wife Sheila were in Philadelphia from Montana. They came to visit the National Catholic Bioethics Center in Overbrook for a certification program. “One of the ladies at the center mentioned this presentation and coming here was a bonus,” Deacon Malone said. Attending the preceding Mass for married couples was another gift. “Archbishop Chaput is one of our generals,” Deacon Malone said. Margie Dieter is a member of a Padre Pio prayer group at St. Joseph’s Parish in Collingdale. She said the main reason she came was that in her work at Crozer Chester Medical Center in Chester she was familiar with the case of a little boy, Paul, who was critically ill.
“I’ve always liked Padre Pio so I came,” said Libby Valesquez, of St. Anthony of Padua Parish in Camden, N.J.
“My neighbor told me about Padre Pio, so I came to pray,” said Tom Nguyen, who traveled to the cathedral from Collingswood, N.J., with his little daughter, Daisy. 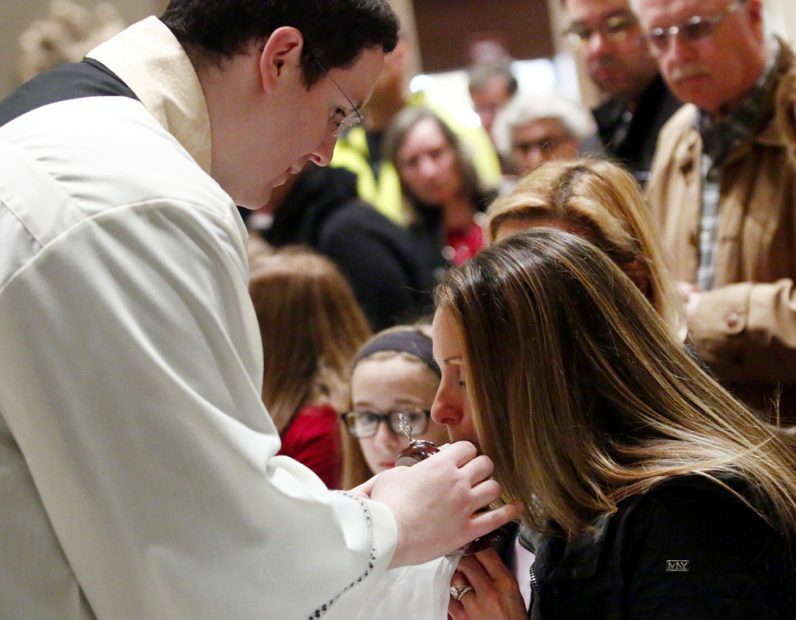 “I’m here because my mother has a strong devotion to Padre Pio,” said Harry Gorman of Barto, Pa.
Elizabeth Laskowski, who was there with her daughter Maura, had a very personal reason for coming and it was in thanksgiving, not intercession. “We are adoptive parents and he helped bring Maura into the family,” she said.